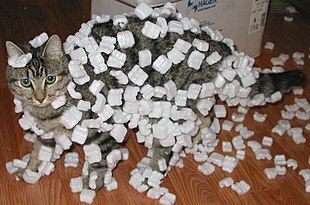 Styrofoam peanuts clinging to a cat's fur due to static electricity. The triboelectric effect causes an electrostatic charge to build up on the fur due to the cat's motions. The electric field of the charge causes polarization of the molecules of the styrofoam due to electrostatic induction, resulting in a slight attraction of the light plastic pieces to the charged fur. This is also the cause of static cling in clothes. Electrostatics is a branch of physics that studies electric charges at rest. Since classical physics, it has been known that some materials such as amber attract lightweight particles after rubbing. The Greek word for amber, ήλεκτρον, or electron, was the source of the word 'electricity'. Electrostatic phenomena arise from the forces that electric charges exert on each other. Such forces are described by Coulomb's law. Even though electrostatically induced forces seem to be rather weak, some electrostatic forces such as the one between an electron and a proton, that together make up a hydrogen atom, is about 36 orders of magnitude stronger than the gravitational force acting between them. There are many examples of electrostatic phenomena, from those as simple as the attraction of the plastic wrap to one's hand after it is removed from a package to the apparently spontaneous explosion of grain silos, the damage of electronic components during manufacturing, and photocopier & laser printer operation. Electrostatics involves the buildup of charge on the surface of objects due to contact with other surfaces. Although charge exchange happens whenever any two surfaces contact and separate, the effects of charge exchange are usually only noticed when at least one of the surfaces has a high resistance to electrical flow. This is because the charges that transfer are trapped there for a time long enough for their effects to be observed. These charges then remain on the object until they either bleed off to ground or are quickly neutralized by a discharge: e.g., the familiar phenomenon of a static 'shock' is caused by the neutralization of charge built up in the body from contact with insulated surfaces. These physical constants (ε0, k0, e) are currently defined so that ε0 and k0 are exactly defined, and e is a measured quantity. The electrostatic field (lines with arrows) of a nearby positive charge (+) causes the mobile charges in conductive objects to separate due to electrostatic induction. Negative charges (blue) are attracted and move to the surface of the object facing the external charge. Positive charges (red) are repelled and move to the surface facing away. These induced surface charges are exactly the right size and shape so their opposing electric field cancels the electric field of the external charge throughout the interior of the metal. Therefore, the electrostatic field everywhere inside a conductive object is zero, and the electrostatic potential is constant. Electric field lines are useful for visualizing the electric field. Field lines begin on positive charge and terminate on negative charge. They are parallel to the direction of the electric field at each point, and the density of these field lines is a measure of the magnitude of the electric field at any given point. From these equations, we see that the electric potential is constant in any region for which the electric field vanishes (such as occurs inside a conducting object). ; they yield equal values for the total electrostatic energy only if both are integrated over all space. This pressure tends to draw the conductor into the field, regardless of the sign of the surface charge. The triboelectric effect is a type of contact electrification in which certain materials become electrically charged when they are brought into contact with a different material and then separated. One of the materials acquires a positive charge, and the other acquires an equal negative charge. The polarity and strength of the charges produced differ according to the materials, surface roughness, temperature, strain, and other properties. Amber, for example, can acquire an electric charge by friction with a material like wool. This property, first recorded by Thales of Miletus, was the first electrical phenomenon investigated by humans. Other examples of materials that can acquire a significant charge when rubbed together include glass rubbed with silk, and hard rubber rubbed with fur. The presence of surface charge imbalance means that the objects will exhibit attractive or repulsive forces. This surface charge imbalance, which yields static electricity, can be generated by touching two differing surfaces together and then separating them due to the phenomena of contact electrification and the triboelectric effect. Rubbing two nonconductive objects generates a great amount of static electricity. This is not just the result of friction; two nonconductive surfaces can become charged by just being placed one on top of the other. Since most surfaces have a rough texture, it takes longer to achieve charging through contact than through rubbing. Rubbing objects together increases amount of adhesive contact between the two surfaces. Usually insulators, e.g., substances that do not conduct electricity, are good at both generating, and holding, a surface charge. Some examples of these substances are rubber, plastic, glass, and pith. Conductive objects only rarely generate charge imbalance except, for example, when a metal surface is impacted by solid or liquid nonconductors. The charge that is transferred during contact electrification is stored on the surface of each object. Static electric generators, devices which produce very high voltage at very low current and used for classroom physics demonstrations, rely on this effect. Note that the presence of electric current does not detract from the electrostatic forces nor from the sparking, from the corona discharge, or other phenomena. Both phenomena can exist simultaneously in the same system. See also: Friction machines, Wimshurst machines, and Van de Graaff generators. 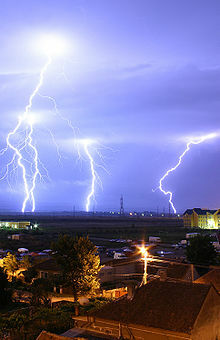 Natural electrostatic phenomena are most familiar as an occasional annoyance in seasons of low humidity, but can be destructive and harmful in some situations (e.g. electronics manufacturing). When working in direct contact with integrated circuit electronics (especially delicate MOSFETs), or in the presence of flammable gas, care must be taken to avoid accumulating and suddenly discharging a static charge (see electrostatic discharge). Electrostatic induction, discovered by British scientist John Canton in 1753 and Swedish professor Johan Carl Wilcke in 1762 is a redistribution of charges in an object caused by the electric field of a nearby charge. For example, if a positively charged object is brought near an uncharged metal object, the mobile negatively-charged electrons in the metal will be attracted the external charge, and move to the side of the metal facing it, creating a negative charge on the surface. When the electrons move out of an area they leave a positive charge due to the metal atoms' nuclei, so the side of the metal object facing away from the charge acquires a positive charge. These induced charges disappear when the external charge is removed. Induction is also responsible for the attraction of light objects, such as balloons, paper scraps and styrofoam packing peanuts to static charges. The surface charges induced in conductive objects exactly cancel external electric fields inside the conductor, so there is no electric field inside a metal object. This is the basis for the electric field shielding action of a Faraday cage. Since the electric field is the gradient of the voltage, electrostatic induction is also responsible for making the electric potential (voltage) constant throughout a conductive object. Before the year 1832, when Michael Faraday published the results of his experiment on the identity of electricities, physicists thought "static electricity" was somehow different from other electrical charges. Michael Faraday proved that the electricity induced from the magnet, voltaic electricity produced by a battery, and static electricity are all the same. Static electricity is usually caused when certain materials are rubbed against each other, like wool on plastic or the soles of shoes on carpet. The process causes electrons to be pulled from the surface of one material and relocated on the surface of the other material. A static shock occurs when the surface of the second material, negatively charged with electrons, touches a positively charged conductor, or vice versa. Static electricity is commonly used in xerography, air filters, and some automotive paints. Static electricity is a buildup of electric charges on two objects that have become separated from each other. Small electrical components can easily be damaged by static electricity. Component manufacturers use a number of antistatic devices to avoid this. When different materials are brought together and then separated, an accumulation of electric charge can occur which leaves one material positively charged while the other becomes negatively charged. The mild shock that you receive when touching a grounded object after walking on carpet is an example of excess electrical charge accumulating in your body from frictional charging between your shoes and the carpet. The resulting charge build-up upon your body can generate a strong electrical discharge. Although experimenting with static electricity may be fun, similar sparks create severe hazards in those industries dealing with flammable substances, where a small electrical spark may ignite explosive mixtures with devastating consequences. A similar charging mechanism can occur within low conductivity fluids flowing through pipelines—a process called flow electrification. Fluids which have low electrical conductivity (below 50 picosiemens per meter), are called accumulators. Fluids having conductivities above 50 pS/m are called non-accumulators. In non-accumulators, charges recombine as fast as they are separated and hence electrostatic charge generation is not significant. In the petrochemical industry, 50 pS/m is the recommended minimum value of electrical conductivity for adequate removal of charge from a fluid. An important concept for insulating fluids is the static relaxation time. This is similar to the time constant (tau) within an RC circuit. For insulating materials, it is the ratio of the static dielectric constant divided by the electrical conductivity of the material. For hydrocarbon fluids, this is sometimes approximated by dividing the number 18 by the electrical conductivity of the fluid. Thus a fluid that has an electrical conductivity of 1 pS/cm (100 pS/m) will have an estimated relaxation time of about 18 seconds. The excess charge within a fluid will be almost completely dissipated after 4 to 5 times the relaxation time, or 90 seconds for the fluid in the above example. Charge generation increases at higher fluid velocities and larger pipe diameters, becoming quite significant in pipes 8 inches (200 mm) or larger. Static charge generation in these systems is best controlled by limiting fluid velocity. The British standard BS PD CLC/TR 50404:2003 (formerly BS-5958-Part 2) Code of Practice for Control of Undesirable Static Electricity prescribes velocity limits. Because of its large impact on dielectric constant, the recommended velocity for hydrocarbon fluids containing water should be limited to 1 m/s. Bonding and earthing are the usual ways by which charge buildup can be prevented. For fluids with electrical conductivity below 10 pS/m, bonding and earthing are not adequate for charge dissipation, and anti-static additives may be required. Electrostatic induction was used in the past to build high-voltage generators known as influence machines. The main component that emerged in these times is the capacitor. Electrostatic induction is also used for electro-mechanic precipitation or projection.In such technologies, charged particles of small sizes are collected or deposited intentionally on surfaces. Applications range from Electrostatic precipitator to Spray painting or Inkjet printing. Recently a new Wireless power Transfer Technology has been based on electrostatic induction between oscillating distant dipoles. Faraday, Michael (1839). Experimental Researches in Electricity. London: Royal Inst. Halliday, David; Robert Resnick; Kenneth S. Krane (1992). Physics. New York: John Wiley & Sons. ISBN 0-471-80457-6. Griffiths, David J. (1999). Introduction to Electrodynamics. Upper Saddle River, NJ: Prentice Hall. ISBN 0-13-805326-X. Hermann A. Haus; James R. Melcher (1989). Electromagnetic Fields and Energy. Englewood Cliffs, NJ: Prentice-Hall. ISBN 0-13-249020-X. ^ Matthew Sadiku (2009). Elements of electromagnetics. p. 104. ISBN 9780195387759. ^ a b Purcell, Edward M. (2013). Electricity and Magnetism. Cambridge University Press. pp. 16–18. ISBN 1107014026. ^ Heras, J. A. (2010). "The Galilean limits of Maxwell's equations". American Journal of Physics. 78 (10): 1048. arXiv:1012.1068. Bibcode:2010AmJPh..78.1048H. doi:10.1119/1.3442798. ^ "Electricity". Encyclopaedia Britannica, 11th Ed. 9. The Encyclopaedia Britannica Co. 1910. p. 181. Retrieved 2008-06-23. ^ Heilbron, J. L. (1979). Electricity in the 17th and 18th Centuries: A Study of Early Modern Physics. Univ. of California Press. ISBN 0520034783. ^ Sarkar, T. K.; Mailloux, Robert; Oliner, Arthur A., Ed. (2006). History of Wireless. John Wiley and Sons. p. 9. ISBN 0471783013. William J. Beaty (1997) "Humans and sparks; The Cause, Stopping the Pain, and 'Electric People"
Look up electrostatics in Wiktionary, the free dictionary. Man's static jacket sparks alert". BBC News, 16 September 2005. "Can shocks from static electricity damage your health?". Wolfson Electrostatics News pages.